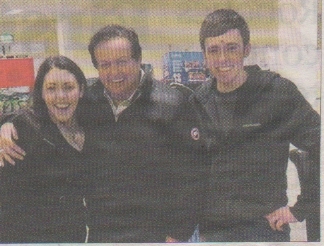 SHOPPERS, especially GAA fans, were delighted when RTE sports personality Marty Morrissey and his mother made a surprise visit to the N17 Superstore in Milltown recently. Marty and mum were on their way back to Co Clare from Knock Shrine when they stopped and did their grocery shopping in the store. Members of the Naughton family from Bodane who operate the store and their staff as well as the shoppers were delighted when Marty and his mum posed for photographs and signed autographs. “He was a real gentleman with a great sense of humour, and his mother was also a lovely lady. It was such a surprise for us when they stopped off to shop here and they stayed around for ages and were in rush to leave,” says Karen Naughton-O’Beirne.